Flavored oils are the perfect method! When you cook up a batch of candy, you simply add a few drops of your desired flavoring oil or extract to the mix. Here is a basic recipe for hard candy. Simple enough. With chocolate, however, it's a bit different. Add too much liquid - it seizes. That's where highly-concentrated oils come in handy. 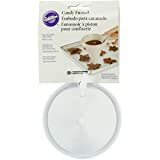 Although a few of them are not recommended for use with chocolate (if they're water-based) - I've used them anyway, and I've never had any problems. What ingredients do we need for flavored chocolate candy? High-quality coating chocolate. Why coating (or dipping) chocolate? Because this type of chocolate has been designed for quick and easy melting without having to go through an elaborate tempering process. If you would throw a Hershey's milk chocolate bar in the microwave, it would melt down and seize into an ugly lump. Then you could neither pour it into molds, nor stir some luscious flavoring into it. 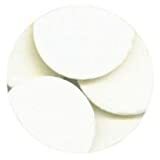 Coating chocolate, however, has the cocoa butter replaced by vegetable oil. It will melt evenly and stay pourable for a while. Finally, it will set up hard in the freezer - with a nice shine to boot. Food-grade flavored oils. My favorite brand is LorAnn. They offer a huge selection of flavors that are so much fun to play with. Unlike extracts, these oils are strong, and often you don't need more than a drop or two for, let's say, 1/2 pound of chocolate. In this picture you see about 2 cups of coating chocolate - ready to be nuked. Start with 30 seconds, then stir, and then heat some more, in 10-second increments. Once your chocolate is smooth, stir in 1 drop of flavoring oil; taste and add more if desired. You may also add nuts, candy pieces, dried fruit, or whatever you like. 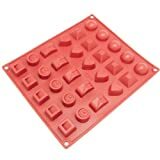 Spoon your chocolate mix into special chocolate candy molds, and then stick them in the freezer for 15-20 minutes. They should pop out easily. If you'd like to learn more about filled chocolate candy, please visit my Squidoo lenses on this subject: Molded Chocolates and Espresso Sea Salt Caramel Truffles. In the picture to the right you can see my candy creation "Inside Seth Godin's Head". It's made from colorized white chocolate, royal icing (eyes) and caramel filling. What else can you do with flavored oils? Spiffy up your same old vanilla pudding with butterscotch, praline, English toffee, hazelnut, almond, or pistachio flavors. Try combinations such as toffee/praline/hazelnut! Puree fresh raspberries or strawberries with a few spoonfuls of honey or agave syrup, and add a couple drops of almond or other nut flavors, and perhaps a bit of orange oil. Serve as a sauce with cake, or over ice cream. Agave nectar is a wonderful, natural sweetener, now widely available even in regular grocery stores. Add any of the above flavors or other, more extravagant flavorings to a jar of agave nectar; 2 drops per 12 ozs is plenty. 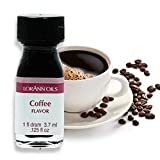 Sweeten and flavor your coffee, tea or hot chocolate, or pour it over cake or ice cream. Or fresh fruit. OMG! I could even imagine some orange oil in the butter sauce for your fish fillet. Think salad dressings - citrus or nutty flavors go well with raw veggies. The possibilities of incorporating flavored oils in your recipes are endless, don't you think? Have you used flavored oils before? Any good tips for us? chefkeem, Thank you for the practical information and product lines. Do you ever use white chocolate? Why is that creation called Seth Godin's head? Love the Seth Godin head chocolates! Thanks for the easy recipes for home made chocolates. 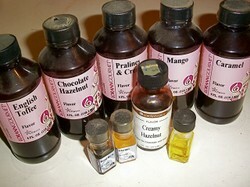 You can make any flavor variation with these flavored oils ... mmmm. click on my LorAnn Amazon ads above. 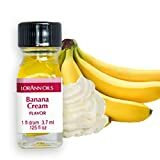 That will take you to the LorAnn product page on Amazon, where you can browse through all flavors. They do have a variety of chocolate flavors in their program. Im trying to make Chocolate hard candy and do not have any choc. flavored oil. Is there anything I can use to substitute? I have used the Lorann brand for making hard candy. Good stuff. I haven't really used flavored oils, but they sound wonderful. Maple, that's what my taste buds are craving right now. I have used flavored oils very limitedly, but I like the effect. Thank you for the wonderful ideas as to how to be more creative. A draw back of mine. Limited imagination. I guess that is how recipes help, Oh and I love the Seth heads. lol. Great job. One of the lessons that I have learned, is that you can get much more depth of flavor in a recipe by using a liqueur instead of an extract for flavor.